Gardeners who live in warm regions are fortunate to have an ideal climate for growing papayas. Papaya trees grow well in warm and sunny locations where they receive adequate water and protection from winds. Select a sunny growing area to plant a small papaya tree. 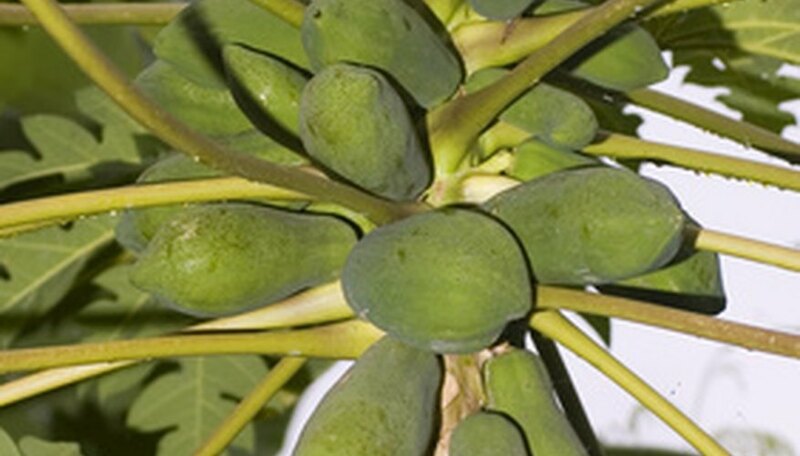 With proper care, the papaya tree will flourish and grow into a towering tree that produces an abundant papaya yield. Select a planting area in full sun that is approximately 12 feet away from other trees and structures. Look above the planting area to ensure there is nothing that will interfere with the future height of the papaya tree (papaya trees may grow to as tall as 20 feet). Dig a hole for the papaya sapling that is three times deeper than the temporary container and four times wider than the planting container. There is no need to amend the soil or add anything to the hole prior to planting the papaya tree. Replace some of the removed soil and then place the papaya tree into the prepared hole. Situate the papaya tree in the hole so it is at the same depth as it was in the temporary container. Fill additional soil into the hole around the papaya tree roots to finish planting the papaya tree. Tamp the soil down firmly around the papaya tree with your hands. Provide water for the newly planted papaya tree immediately after you finish planting it. Keep the papaya tree adequately watered at all times. Depending on the quality of the soil and how warm the temperature is, you may need to water a papaya tree every day during the summer to keep the soil adequately moist. When the weather is cooler or the soil retains more water, you may only need to water the papaya tree twice per week. Fertilize a new papaya tree every two weeks. Use 1/4 lb. of fertilizer for each tree when the trees are small. Approximately eight months after planting a papaya tree, increase the fertilizer amount to 1 to 2 lbs. per tree and decrease the fertilizer frequency to once every two months. Apply 2 to 6 inches of shredded mulch around each papaya tree to keep the soil moist and prevent weeds. Keep the mulch at least 8 inches away from the trunk of the papaya trees and extend the mulch out from the trees approximately 2 feet to create a safe barrier that will prevent damage to the trees from a lawn mower. Monitor the papaya trees for insect infestations. If you notice a flying insect that resembles a wasp (papaya fruit fly), cover the developing papaya fruits with brown paper lunch bags to keep the fruit flies from infesting the fruits. Leave the bags on the fruits until you harvest them. Manually pick off other insects as you see them or remove them by hosing them off. Harvest papaya fruit when at least 1/3 of the outer rind is yellow. Waiting until more of the fruit turns yellow will produce a sweeter papaya. Ripen the papayas at room temperature for up to one week before eating.